« John Byrne goes to “Strange New Worlds” with Star Trek Annual 2013! 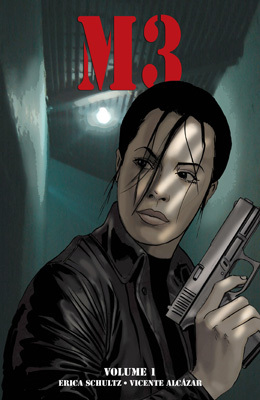 M3 is a thrilling action revenge comic with awesome potential for other mediums and continued stories. With smart, aware writing from Erica Schultz and slick, emotive art from Vicente Alcázar, M3′s Machiavella Maria Marcona or Mackenzie Maria McGrath or Megan Macey Martin or Melissa Martina Matthews (you get the point, right?) makes for one hell of a driven protagonist with a fun story and lots of people to kill. The action revenge genre is generally left for the film medium with movies like The Bourne series, The Professional, etc. But comics certainly have the visual and contextual components to have a very similar if not, at times, more impactful and visceral impact. Schultz really sets up M3 with a well-structured contemporary story and flashbacks to make her heroine, McGrath a sympathetic and strong lead. McGrath is a “strong female lead” but she’s also just really understandable because of the details that are given about her childhood as well as the contemporary problems she finds in her life. Because there is so much setup in this first trade, M3 has a lot of mundane moments that could easily become boring. However, Alcázar knocks it out of the 11 stories-up glass window with every scene – action packed or not – with his photo-realistic backgrounds and characters. But really, his panel to panel, film-like storytelling is the rolling explosion that blows the cherry right off the top of the Sundae. M3 volume 01 is a flowing and driven book that can easily be read in a single sitting but there’s a lot of complexity and fun that could bring a reader back for multiple readings. If your itching for a summer blockbuster, give M3 a try. This entry was posted in Columns and tagged Erica Schultz, m3, The Bourne series, The Professional, Vicente Alcázar, vices press. Bookmark the permalink. Follow any comments here with the RSS feed for this post. Post a comment or leave a trackback: Trackback URL.